St. Mary’s University will host its third annual 5K run/walk – the StMU 5K for the Neighborhood – Sunday, Oct. 23, at 9 a.m. on campus. This year, proceeds will go to the Society of St. Vincent De Paul, one of the oldest charities in South Texas. It has been assisting the under-served – “without regard to race, creed, gender, marital status, national origin, age or physical handicap” – since 1871. Funds will be funneled into its services that benefit the West Side. Members of the community surrounding St. Mary’s are welcome to participate, and they are invited to bring their spayed or neutered, leashed, dogs to join them. The University has partnered with SNIPSA and will offer information about spay-neuter services. 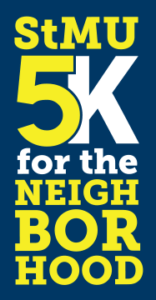 The StMU 5K is part of an ongoing effort to enhance quality of life through neighborhood revitalization. St. Mary’s strives to be a vital partner in promoting the health and wellness, education and safety of the Gateway District community. Last year, more than 500 attended the run, which benefited The Neighborhood Place, a facility that provides a network of educational, recreational and supportive services for families and residents of all ages in surrounding areas. 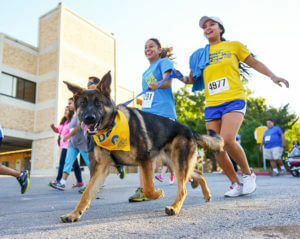 The inaugural StMU 5K benefited local United Way agencies and SNIPSA. The St. Mary’s University Neighborhood Revitalization Project was established in 2007. Together with neighbors, business proprietors and the City of San Antonio, the University has focused on commercial transformation, housing rehabilitation, education, and infrastructure and quality-of-life improvements. There are new pocket parks, street signs, bus stops, bike lanes, crosswalks and trees; improved sidewalks, streets, and business facades; and new construction of homes and a multifamily apartment complex. The StMU 5K is sponsored by Ryan Companies US Inc., Wal-Mart, Lisa’s Mexican Restaurant, Aramark, State Rep. Justin Rodriguez, and Keller-Martin Construction Inc. When: Sunday, Oct. 23, 2016. Opening remarks at 8:45. 5K begins at 9 a.m. Amenities: Food, beverages and music before and after the 5K. Awards ceremony at 10 a.m.
Wednesday, Oct. 19, 10 a.m.-7 p.m.
Thursday, Oct. 20, 1-7 p.m.
Friday, Oct. 21, 1-7 p.m.
Sunday, Oct. 23, 7:30-8:45 a.m.